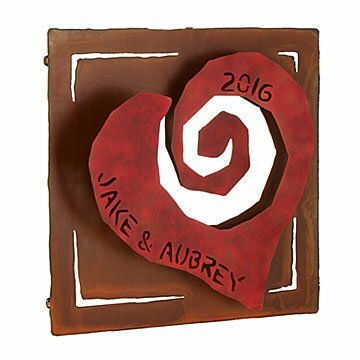 Handcrafted out of steel, this fluttering work of art makes a creative wedding or 11th anniversary gift. Celebrate a romance that just grows stronger through the years with this labor of love by metalsmith Chris Crooks. He deftly shapes, paints, and seals sheets of solid 16-gauge mild steel into eye-catching artwork. The spiral heart playfully pops out from the frame, fluttering gently as it hangs from the wall. The piece is personalized with the couple's names and the year they wed. The carefully incised characters cast alluring shadows on the copper-colored frame, adding an extra dimension of intrigue to the design. Solidly constructed to be cherished through time, each 3D display of devotion makes a creative wedding or 11th anniversary gift. Handmade in Arizona. Wipe clean with a damp cloth, if needed. Item arrives with attached sawtooth hangers for easy hanging. This heart is absolutely beautiful. Would definitely buy again for another wedding. Every time I purchased this heart, it was for a wedding. The recipients have love the gift. Love my new wall sculpture! Can't wait to find the perfect spot in the house to hang it, although my hubby wants to hang it in our greenhouse (we spend a lot of time in there from spring to fall). Very pleasing and high quality. Great gift for special couple! I imagine this gift will be put in a special place where it can be seen & enjoyed daily. A great unique wedding or anniversary gift! Absolutely love this piece!! We love metal and personalized items so this was a homerun. Great weight and quality! I would think about this if the occasion arose. It is very creative for a special date. It was exactly as I expected adorable.